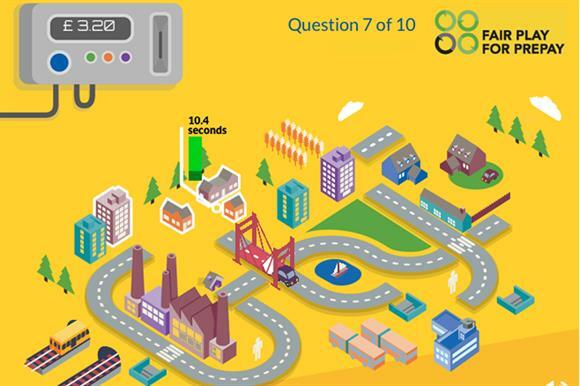 Citizens Advice has launched an online game to test consumers' knowledge of their rights when it comes to pre-paid gas and electricity meters. The game is part of a wider campaign, Fair Play for Prepay, in which the advice charity is calling on energy suppliers to provide a better service to customers who use these meters. This includes providing them with the option to top up online or over the phone, and offering multiple tariffs to help consumers get the best value for their money. In the game, players are given an online map featuring various properties, as well as an on-screen meter showing their balance. As they play, properties light up and the player has to click on them and answer a question quickly before the meter runs out. If they answer questions correctly their balance increases, but an incorrect answer will cut it further. If it reaches zero, the game is over. Whether they answer incorrectly or correctly, the player is given additional information about what to do if they find themselves in that situation in real life. Citizens Advice has launched an online petition about the issue. And the charity is asking people to tweet pictures of their awkwardly placed prepayment meters using the hashtag #tweetyourmeter – examples so far include meters positioned in cupboards, on ceilings and in a hedge outside. There is also a ‘myth-buster’ on the website to help make customers aware of their rights. Although they pay on average of £80 a year more than direct debit customers, Citizens Advice says those on pre-paid meters have limited payment options and often experience faulty equipment and poor customer service. The charity cites a study by Smart Energy GB, which found that 48 per cent of British people would use smart pay-as-you-go services to buy their gas and electricity if these were available to them. The issue is also particularly relevant at this time of year. Evidence collected by the charity shows that 16 per cent of meter users are cut off during the winter, either because they cannot afford to buy more energy or because they are unable to get to a shop and top up their meters. This is a fun way to educate people who use pre-pay meters about what they can expect from energy companies, while raising awareness about this issue among those who don’t.